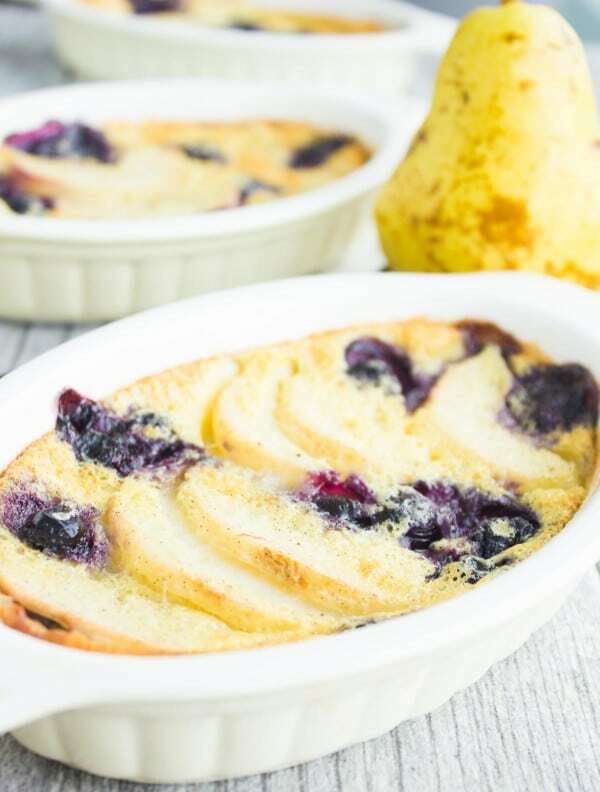 Fans of rustic French desserts will love this blueberry pear clafoutis made with a smooth vanilla bean custard! A lovely late summer twist on the classic French Cherry Clafoutis, easy to make and the perfect highlight to end a dinner party. 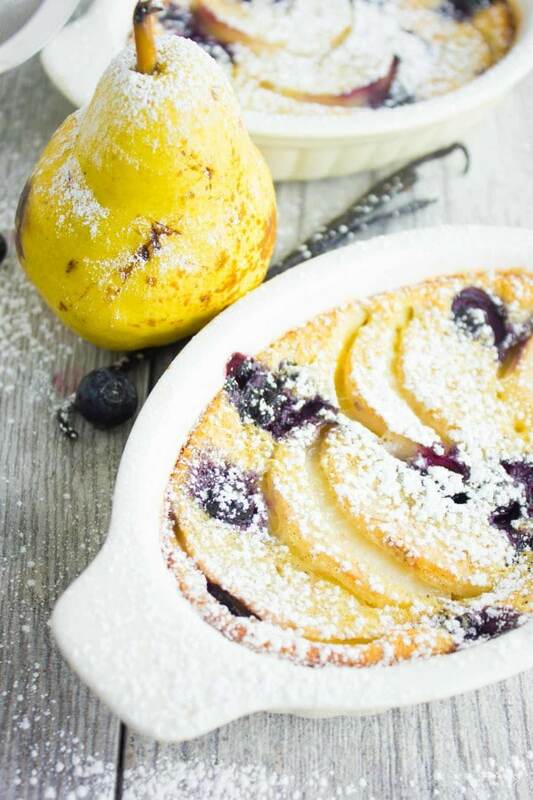 This pear blueberry vanilla clafoutis recipe is a silky sweet French dessert dream. 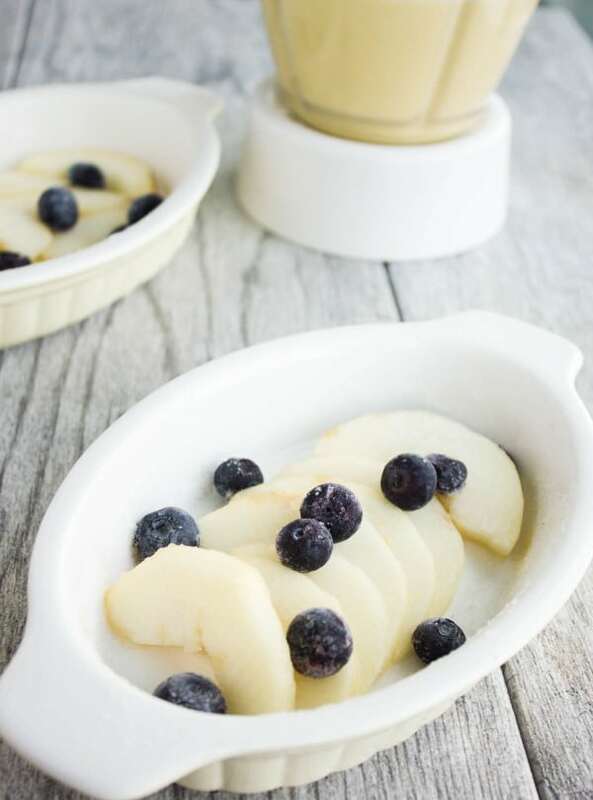 Fresh sliced pears are arranged with blueberries, then a silky vanilla custard is poured on top. While it bakes, the custard puffs up, the pears and blueberries soften and float to the top. Every bite is a melody of pear, vanilla, blueberries, and smooth vanilla custard. When I was young, we lived in Paris for over 4 years. I have fond memories of France, it’s a place I always associate with sophistication and great food. It was there that I began to gaze at delicate French pastries ever so beautifully displayed in patisseries —kind of like the way my girls gaze at their princess movies. It was there that my mom fell in love with French cuisine and made every effort to learn and perfect it at home. And even after we left France, French cuisine stayed with us and will forever hold a place at our table. So this humble pear clafoutis is a nice late-summer twist on the Classic Cherry Clafoutis, you might have come across before. It’s classically made with dark red sweet cherries (classically not pitted too), and even though anything but cherries will transform this from a clafoutis to a flaugnarde, let’s still simplify our life and stick to naming it clafoutis. 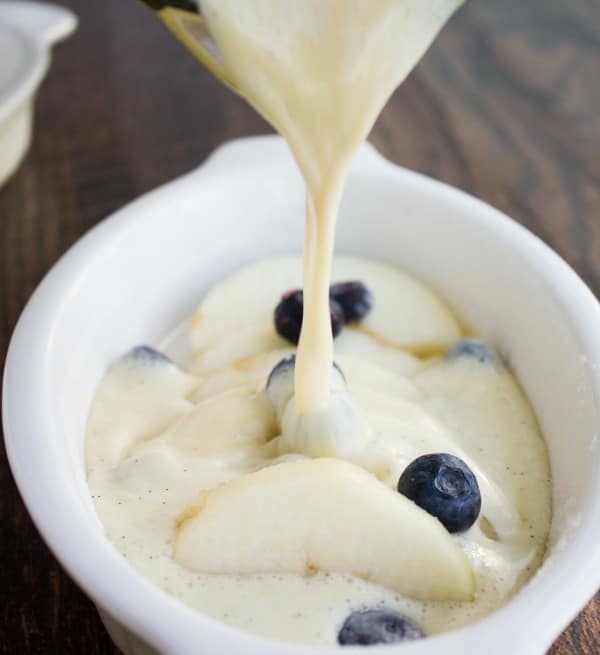 It is basically baked fruit in a smooth silky vanilla bean custard that does contain any flour. So it’s not a flan, and not as firm as a cake or cobbler. It’s rather in between. It has a texture almost like a Dutch baby pancake. 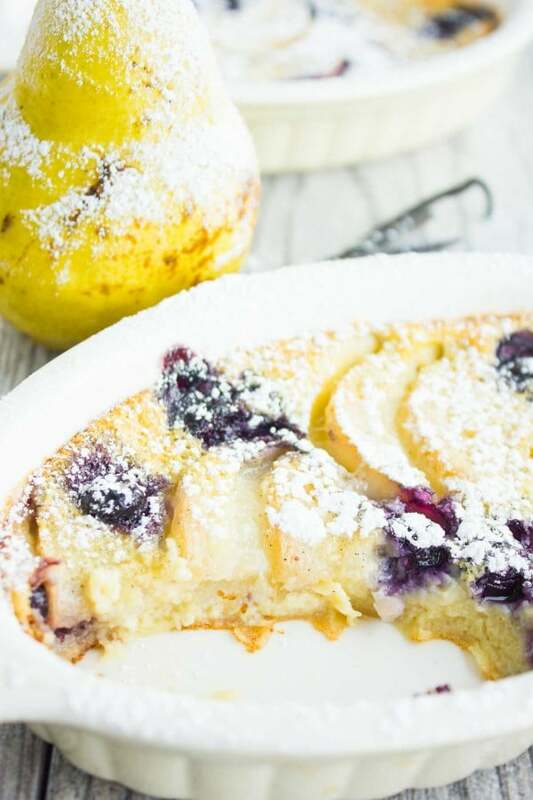 I personally love this vanilla blueberry pear clafoutis and am addicted to the texture of the custard, which we make using real vanilla beans. As for the fruit, my husband happens to love pears, I, on the other hand, happen to only love pears when they’re baked. Today I chose pears for this clafoutis so that we can both enjoy some perfectly ripe sweet delicious pears. The flavour of the custard itself is typically vanilla and I’m sticking to that by using vanilla beans. But I have met clafoutis seasoned with cinnamon, ginger, citrus zests and many other variations. And that’s where you can totally personalize it. The fruit or fruit combinations are also up to you. Preheat the oven to 375 F. Butter 2 large or 3 small baking dishes and dust them with the granulated sugar. Shake out any excess sugar. In the bowl of a blender, combine the half and half, brown sugar, flour, vanilla, eggs and salt and blend for a minute until the batter is smooth. Pour this batter over the pears and don’t worry if they start to float. 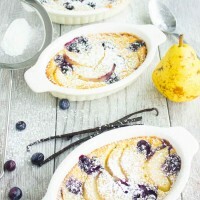 Bake your Blueberry Pear Clafoutis for 18-20 minutes until the custard is puffed, slightly golden and set. It should not jiggle. Cool for a few minutes and enjoy warm or chilled. Serve dusted with confectioner’s sugar if desired. 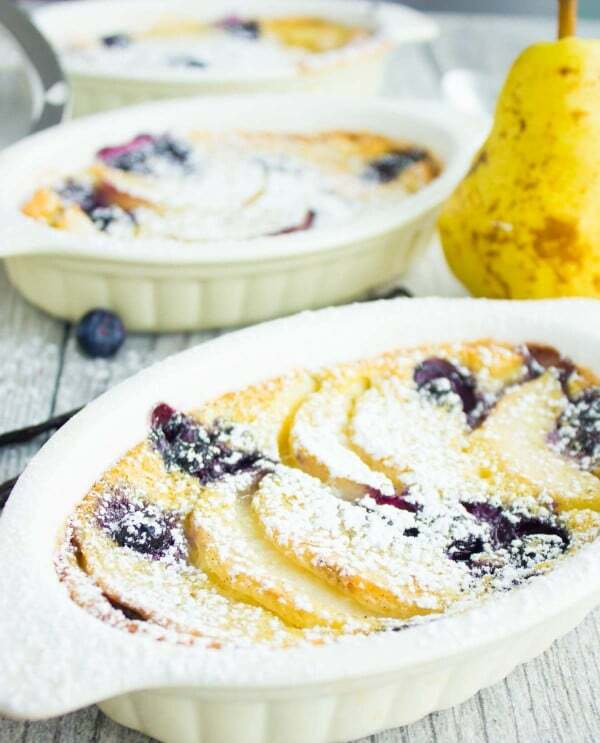 Double or triple this batch of blueberry pear clafoutis for a larger company and bake it in one large dish for convenience, or make a tiny batch and enjoy it right away! Feel free to swap pears for apples or apricots and season the custard with cinnamon, lemon zest or nutmeg. Clafoutis is best eaten the day it’s made but the custard can theoretically be stored in the fridge for up to three days. Love French desserts? Try my Frangipane Tart with Figs! Butter 2 large or 3 small baking dishes and dust them with the granulated sugar. Shake out any excess sugar. Peel and core the pear and slice it to about 1/8th of an inch thick slices and arrange it on the baking dish. Scatter the fresh or frozen blueberries around and on top of the pears. In the jar of a blender, combine the half and half, brown sugar, flour, vanilla, eggs and salt and blend for a minute until the batter is smooth. Pour this batter over the pears and don’t worry if they start to float. Bake for 18-20 minutes until the custard is puffed, slightly golden and set. It should not jiggle. Cool for a few minutes and enjoy warm or chilled. Serve dusted with confectioner’s sugar if desired. Clafoutis is best eaten the day it's made but the custard can theoretically be stored in the fridge for up to three days. Saying a recipe has the texture of a Dutch baby is very strange. Hi M, the recipe texture is compared to a Dutch baby pancake, have you had it before? Paris for four years? How dreamy… and speaking of dreamy this dessert would be sooo elegant at a dinner party. I absolutely LOVE clafoutis, but can you believe I’ve never actually made it myself? That so needs to change! hahahaha I believe you! But now seriously, things need to change! Clafoutis is my favorite fruit tart. Pear and blueberry are so great together! I should try it! What an adorable dessert. I’ve always like individual treats — they make a person feel special. Something just for them. I like the idea of the pear and blueberry instead of the cherries. I have some small gratin dishes that would be ideal for this dessert. 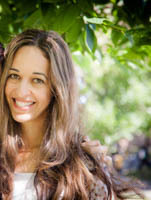 Marisa, I absolutely LOVE individual servings–desserts, appetizers, everything! Hope you make this one! 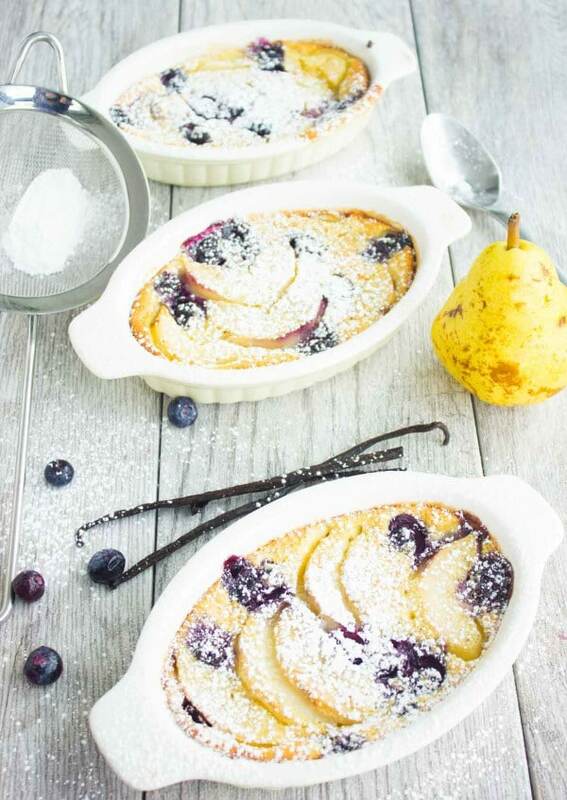 I agree with you made this humble clafoutis double delicious with pear and blubeberry . I have only tried cherry version. I am going to give this one a try. Swathi, I think this beats the classic cherry clafoutis by far!! you need to try it!